Packaging is in 1-gallon (12 lb) pails and 5-gallon (60 lb) pails. CLEAR AQUATHANE UA-210 products are available in six grades and three different gloss levels. Colored Aquathane UA-210 products are available in six grades, three gloss levels, 900 standard colors as well as custom-matched colors. Aquathane UA210 Liquid Color Paks can be used for field tinting, adjustment or matching of colors. Tint strength of each color pack is moderated to make field tinting as user-friendly as possible. This discounted set of 8 Color Paks provides the lattitude needed to tint or off-tint your Aquathane Color or Tint Base to perfection! AQUATHANE UA-210 Tint Base products are mixed with Aquathane UA210 Color Packs to achieve a wide range of colors. Use Deep Tint Base (Clear) for intense colors, Medium Tint Base (White) for color of medium intensity and White Tint Base (Stronger White) for Pastels. Available in six grades and three different gloss levels. EDISON AQUATHANE UA-210 Type G additive promotes adhesion to hard, non-porous and glazed surfaces. 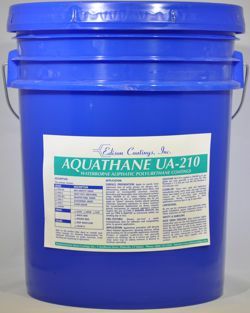 Added to the corresponding size container of Aquathane UA210, Type G additive chemically reacts to form string durable bonds. Use within 4 hours of mixing. EDISON AQUATHANE UA-210 Matting Agent may be added to Gloss or Satin formulations to further reduce gloss. One pouch contains the maximum quantity of Matting Agent that may be added to 1 gallon of Aquathane UA210 Gloss. For addition to Satin formulations, use 1/2 the contents of the pouch. EDISON AQUATHANE UA-210 Type WR additive is a fluoropolymer designed to increase water and stain resistance. A 4 oz. bottle of the additive is simply stirred into 1 gallon of any grade of Aquathane UA210. The mixture is stable and does not have a limited pot life.